Monopoly is one of the most common games owned, but is also regarded by serious board game fans as one of the worst to play because you can end up stuck in a hopeless slow decline, be out before the game is over, and be stuck playing for hours with very little gain. As a family game it can be tediously slow and aggressively cut throat. We play Monopoly in a very different way that would drive lots of purists nuts, but for us makes the game fast, family friendly, less ruthless and more fun. 1: Play in teams so that kids don't get bored waiting too long for their turn. 2: Forget the amount of money you are supposed to start with. Be generous dishing out the dosh - more money at the start means a much faster game where the aim is to get complete sets of properties by either buying them or trading them. 3. Keep the money perks rolling - we dish out £200 for landing on go, as well as the normal £200 for passing it. 4. Taxes get tucked under the corner of 'Free Parking' to be collected by anyone who lands on that space. 5. Game is played for no more than 1hr, then the winner determined by a quick tally such as number of £100 and £500 notes, number of sets of properties and number houses depending on how far along the game got. I know a lot of folks will roll their eyes at all of this, but it means that we are able to play a fairly complex game with a three and a five year old, with all the benefits that are inherent in the game, including time doing an activity together as a family, the numeracy skills including counting along the right number of places, adding up the numbers on the dice, counting out correct money to buy properties and pay rent, and the literacy skills of reading the names of the properties. 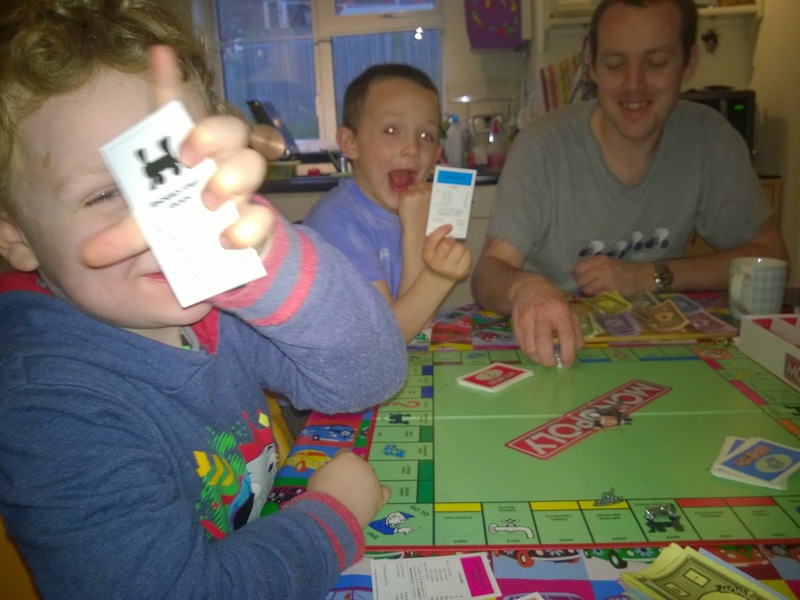 For very young players even just matching groups of colours of properties is a good skill - Toby was in charge of rolling the dice, organising our properties and handing over cash in return for properties. For Ollie in addition to this he added up the dice, moved the pieces and helped to count out the money. Importantly you also get to model gracious game playing and being a good winner/loser. So, how could you adapt the games you have in your cupboard? I'd love to hear your ideas.